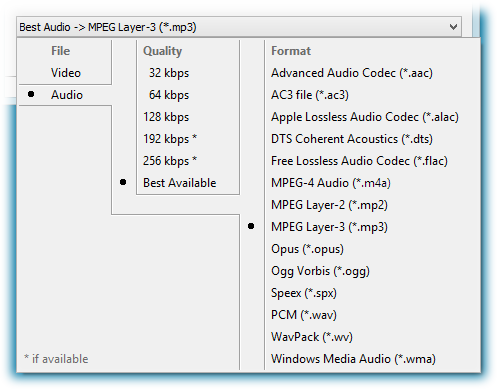 Unlike other modes, this mode does transcoding of downloaded media files to selected format. Note: any transcoding is a loss of quality and/or increase of resulting file size. All modern video and audio players can play formats provided by the supported sites so generally transcoding is not required to play content. However this mode still might be useful in some cases, for example when need to play content on old hardware players. By click on Convert button program automatically selects source file to download. After downloading is finished program performs transcoding to destination format. What should be done in this mode is configured by combo box at the bottom of the window. Options of transcoding to selected format can be changed using menu Tools Converting Settings. These options are global i.e. not preset-wide.